To avoid the conflict in settings on web and iPad, we have successfully aligned some triggers from our website to Repairdesk iPad POS Register app so that when you have enabled/disabled the triggers from web, they will work automatically on iPad app. To know which triggers are aligned, please follow up the details shared below. Head to store settings from your Repairdesk web account and approach module configuration. Under following sections, following triggers will automatically work on iPad if they are enabled/disabled from web account. However please make sure that you haven't forgotten to hit Save button after settings against these triggers are changed from web. To set triggers on POS, head to Module Configuration --> POS as shown below. The details of each of these triggers are shown below. 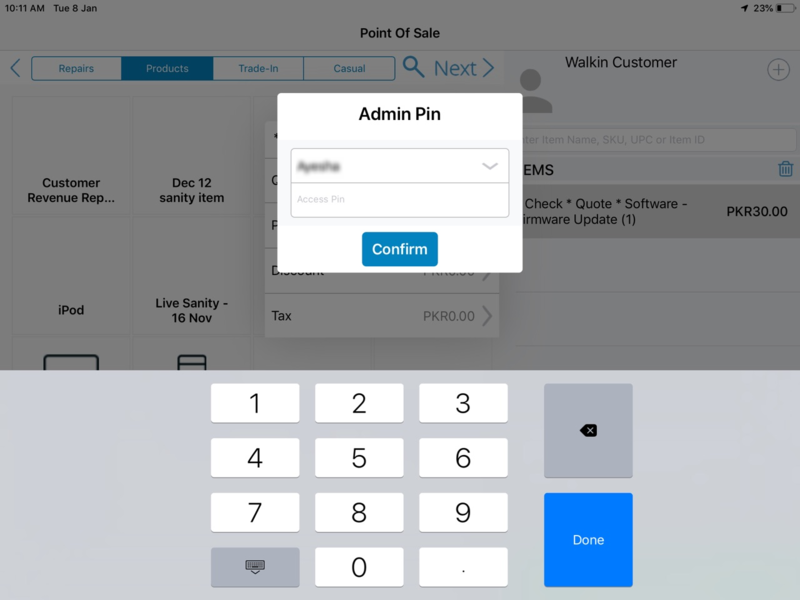 If this trigger is enabled, system will ask you to enter employee access pin before executing any sales transaction from iPad app. You will be asked to enter employee access pin before creating a repair ticket from iPad app. If you have enabled this trigger, it will allow employees to make transaction with out of stock items. 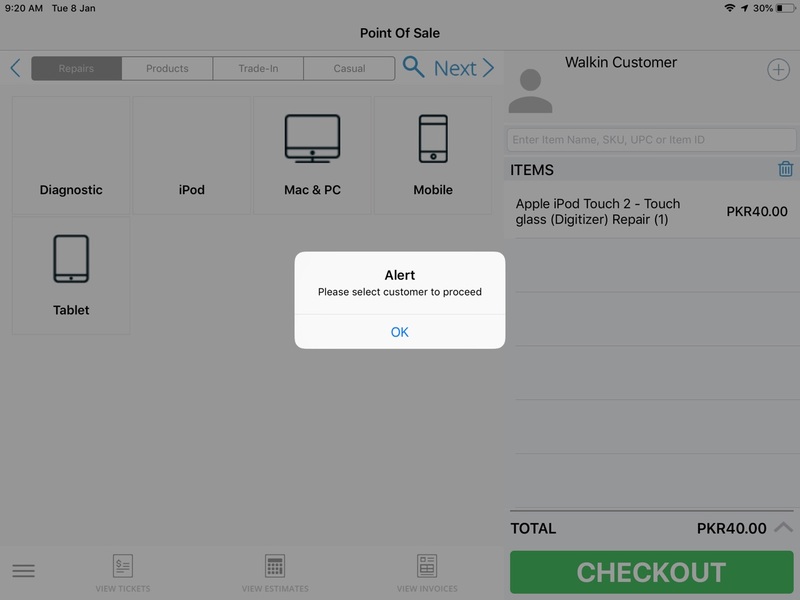 However if the trigger is not enabled, then system will not allow user to process transaction with any out of stock item. As we had introduced the feature to add referral source from our iPad app while adding customer, we have aligned triggers related to referral source from web to iPad app. 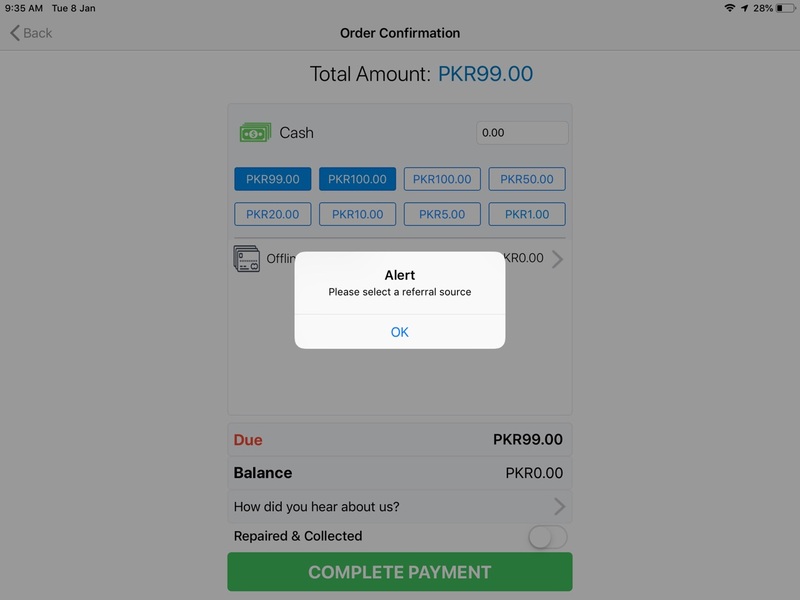 If you have enabled this trigger from web, then it will ask you to enter referral source while adding customer from POS on iPad POS Register app. 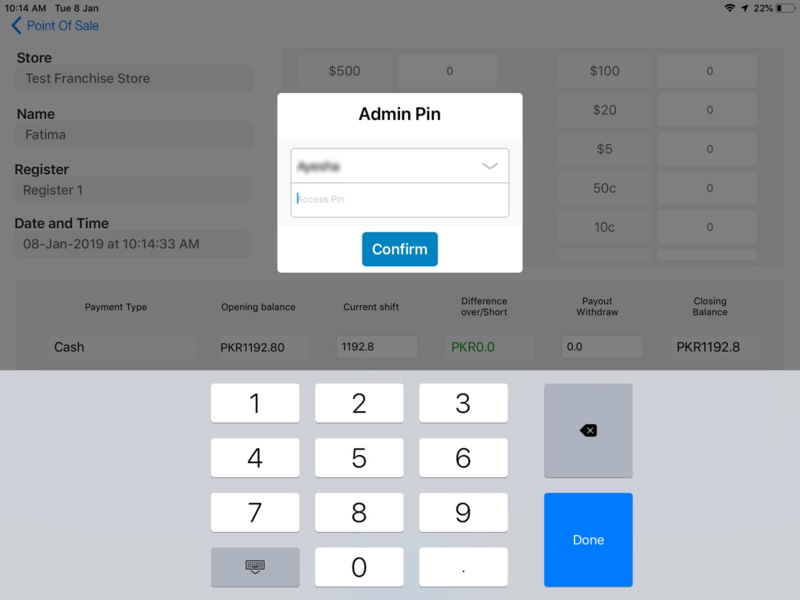 Similar to POS screen, by enabling this trigger, you will be asked to enter referral source before checkout from iPad POS Register app. If this trigger is enabled from web, it will direct the user to add customer information before creating an invoice against accessory item. 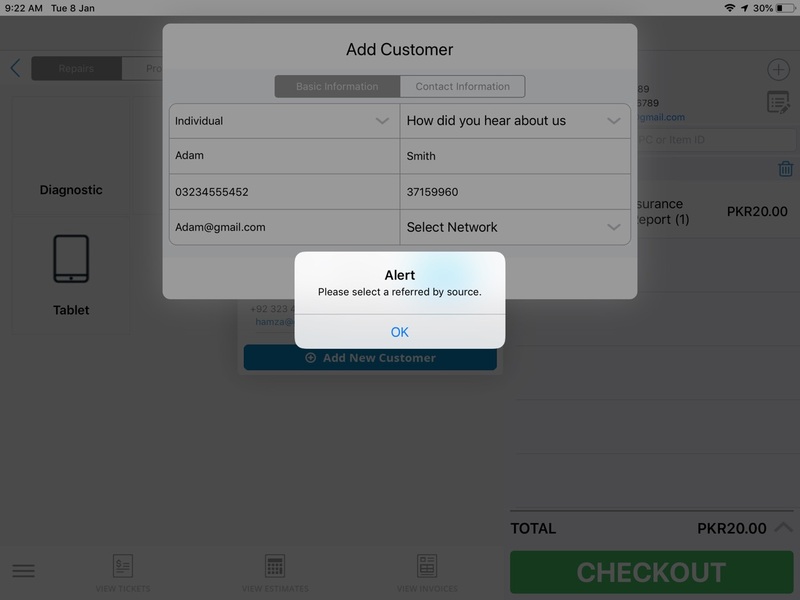 Thus a pop-up message will be displayed asking the user to add customer details to proceed further. 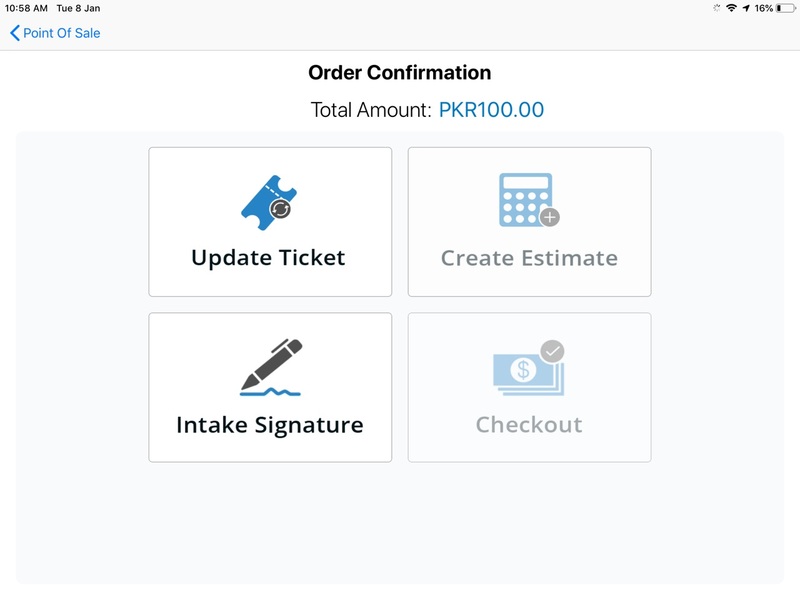 If this trigger is enabled from web, system will not allow you to edit ticket for which invoice has already been created. In this case, edit option will be disabled from view ticket screen. Head to Module Configuration--> Repairs section to make repair triggers work on iPad. 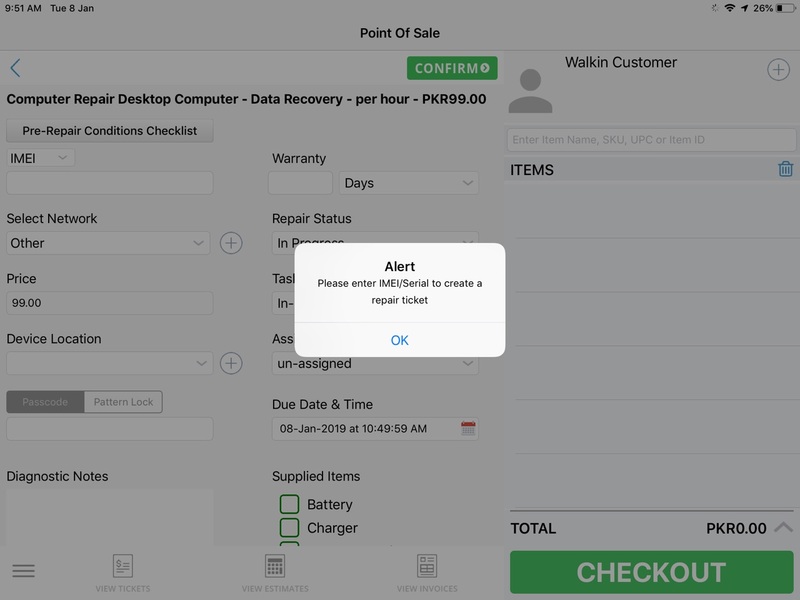 You will be asked to mark per-repair conditions before creating a repair ticket using RepairDesk iPad POS Register app. To know how to mark post and pre repair conditions, please follow the link here. This trigger will make it compulsory to enter IMEI and Serial details before creating a repair ticket from Repairdesk iPad POS Register app. If this trigger is enabled from web, it will direct the user to add customer information before creating a repair ticket from iPad app. 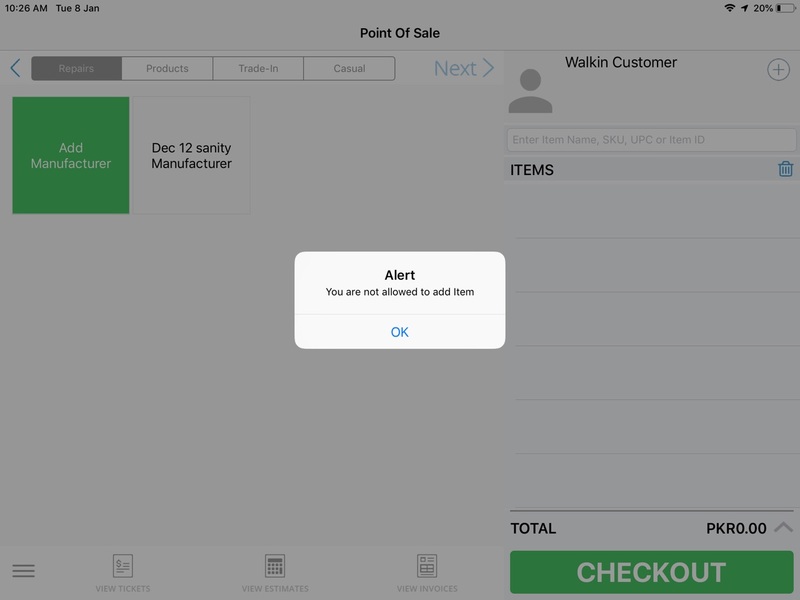 Thus a pop-up message will be displayed asking the user to add customer details to proceed further. 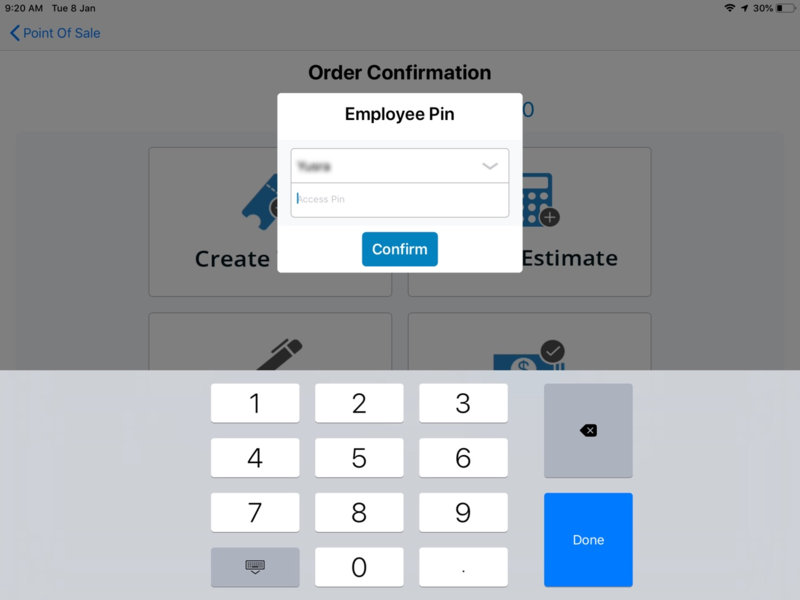 System will ask you to enter employee pin in following cases. While entering value for manual in/out transactions, it will ask you to enter employee access pin. 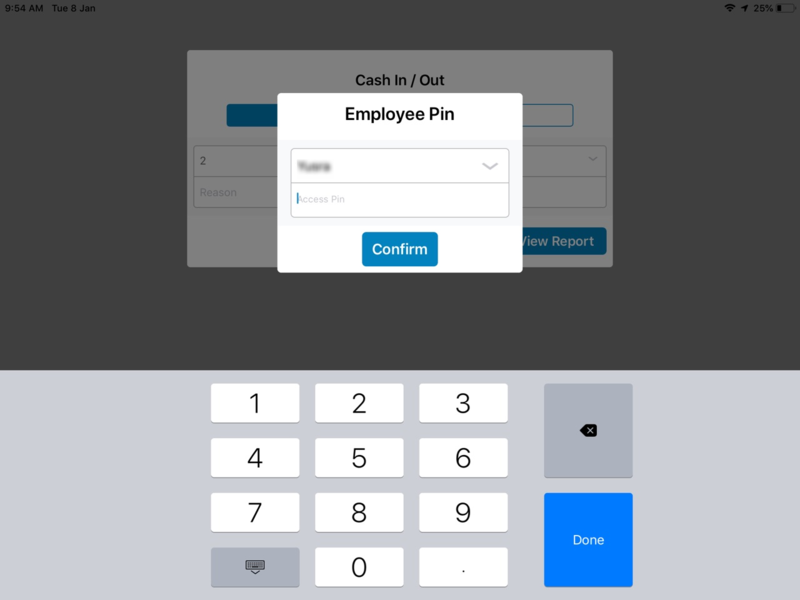 While starting and ending shift through iPad, employee access pin will be required. Admin access pin will be required in following cases if trigger is enabled from web. If this trigger is enabled, system will ask for admin access pin before applying discount. Similarly if this trigger is enabled, system will ask for admin access pin before ending the shift. To make roles and permissions trigger work, head to Employees section from Store Settings--> Employees --> Roles Permissions. Select the role against which you want the triggers to be implemented. The employee with selected role will be able to apply discount from POS only if he has been granted Access permission from these settings. He will not be able to apply discount if the trigger is turned off. The employee with selected role will be able to give refunds from POS only if he has been granted Access permission from these settings. The option to refund will not be shown against paid invoices for that user if access trigger is turned off. The employee with selected role will be able to change price and tax from POS only if he has been granted Access permission from these settings. Otherwise he will not be allowed to change price and tax against items. The employee with selected role will be able to create new item from POS only if he has been granted Access permission from these settings. That user will not be able to create new item if he has not been granted access permission. 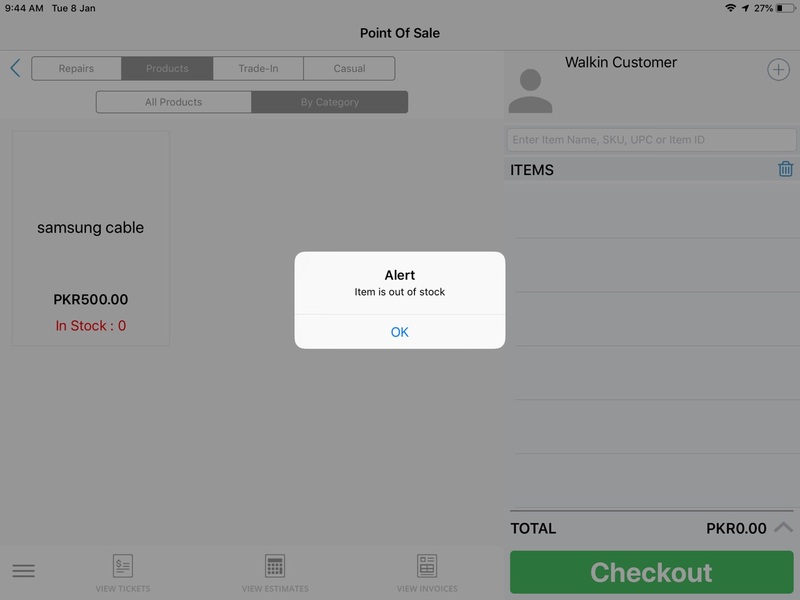 Under Module Configuration --> POS, if this trigger is enabled, then out of stock items will not be shown on POS screen. The employee with selected role will be able to change price and tax from edit tickets only if he has been granted Access permission from these settings. If he does not have access permission, he will not be able to change price and tax against repair tickets. The employee with selected role will be able to view customer details from view tickets only if he has been granted Access permission from these settings. If he does not have access, then customer details will not be shown on View Tickets screen. 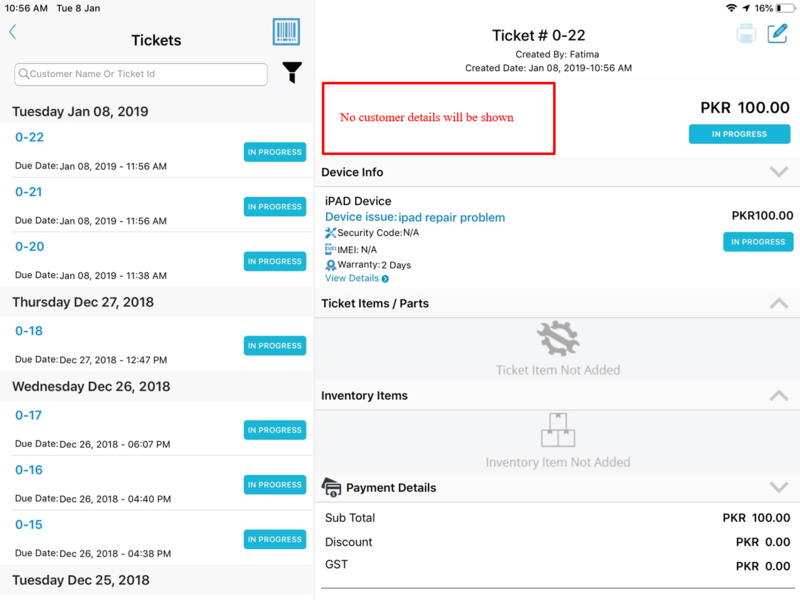 The employee with selected role will be able to apply discount from view tickets only if he has been granted Access permission from these settings. He will not be able to apply discount if he does not have permission and trigger is unchecked. The employee with selected role will be able to change pre device conditions from view tickets only if he has been granted Access permission from these settings. Contrarily, he will not be able to add pre-device conditions and option to add pre-device conditions will be disabled. 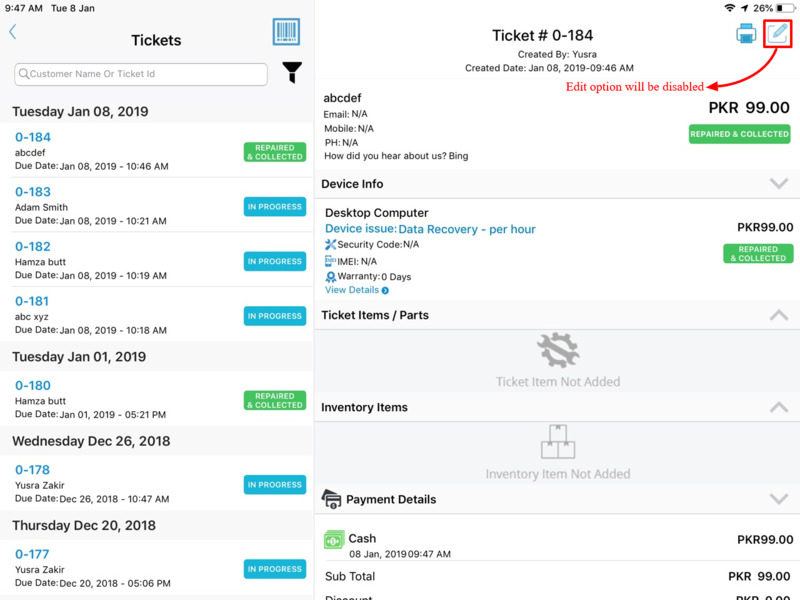 The employee with selected role will be able to create invoice from ticket only if he has been granted Access permission from these settings. 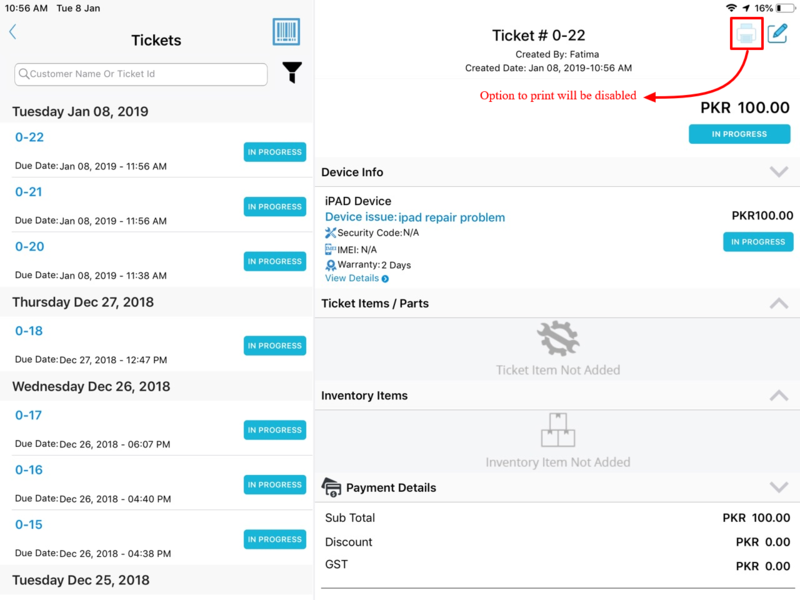 If he does not have access permission, he will not be able to create invoice from ticket and option to checkout will be disabled. The employee with selected role will be able to create new item only if he has been granted Access permission from these settings. Otherwise he will get the following pop-up if he tries to add accessory item or repair part. The employee with selected role will be able to print ticket only if he has been granted Access permission from these settings. The option to print will be disabled if he does not have access permission. Under inventory settings, this trigger will show up only if inventory valuation has been enabled on your account. If this trigger is disabled, then employee with selected role will not be able to add adjustment against stock from iPad POS Register app. 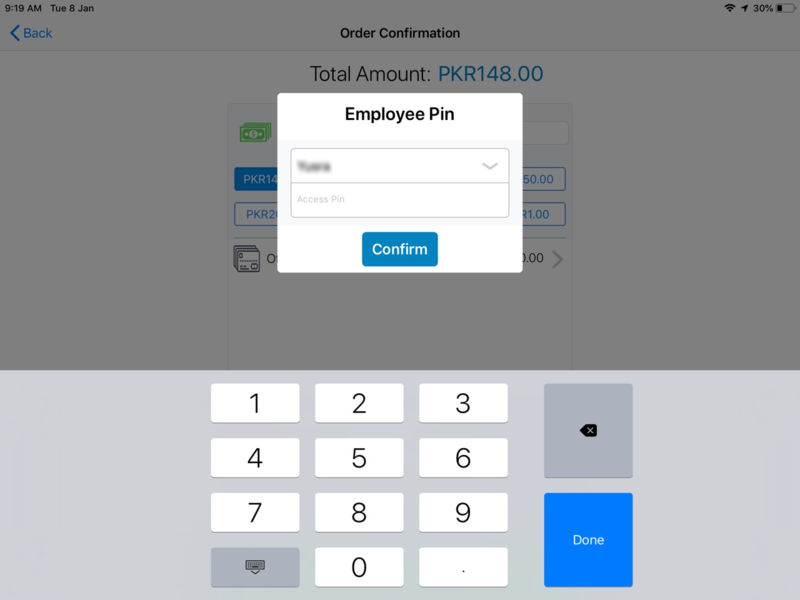 If the access permission has not been granted to an employee from employee roles and permissions section from web, then he will not get an option to view Transaction Log Report on iPad POS Register app. Under payment methods from Store Settings, we have aligned a trigger to show only those payment methods on checkout screen against which this option is enabled. When a new employee is added from web, he will only have access to those stores against which access trigger is enabled. Tickets can be assigned to those employees against which assignment trigger is enabled. Same applies to iPad as well.